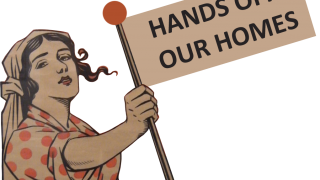 The Hands off our Homes campaign has successfully hit its first target of 1,500 signatures on the petition. This means unions can present to Full Council, and trigger a debate about the future of Holcroft House and Glen Lee. But that’s not all we plan to do. We are calling on all affected employees, union members, friends and family of residents and members of the community to join us in demonstrating the council’s continued proposal to close these vital services. We will provide flags, banners, whistles and all the right stuff to make us seen and heard. The council are starting to getting the Hands off our Homes message but we need to keep the pressure up. After the demonstration, all are invited to attend the public Full Council meeting where Claire Ransom, our Deputy-Branch Secretary, will address councillors about the danger these proposals pose to residents, employees, and the future of care in Southampton. After this there will be a debate between councillors. Bring colleagues, friends, and family. The more the merrier. Click ‘Going’ on the Facebook event HERE and share on your profile. Or you can share it from our Facebook page and our Twitter page. Ask them to oppose the home closures. Template letter is by clicking HERE or request a copy from the UNISON Office (branchsecretary@unisonsouthampton.org.uk / 02380 832740) or Unite Office mark.wood@unitetheunion.org. Keep signing the petition and completing the online consultation. Try asking five people to do the same. 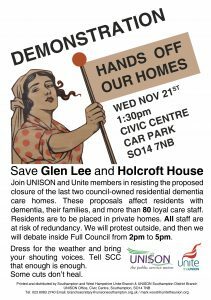 Hands off our Homes is a joint campaign between UNISON and Unite the union. Please help by signing the online petition, and completing the council’s online consultation. 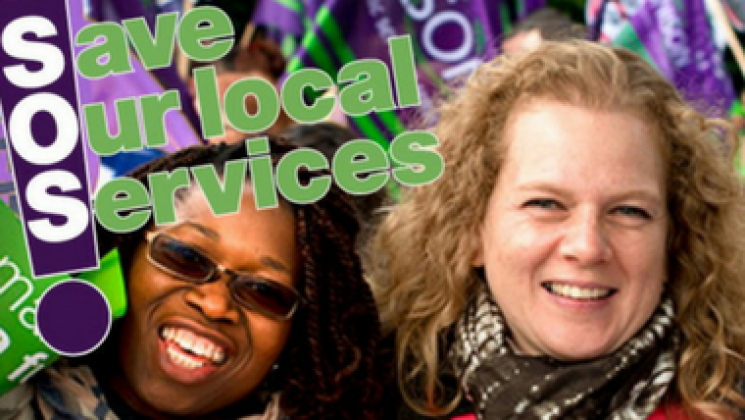 Alternatively, please call UNISON on 02380 832740 or Unite on 02380 834327. Not a member of UNISON? Join online today.